Usually ships in 34 to 37 days Estimated lead times do not include weekends or holidays. Transit time is determined by shipping method and destination. Orders requiring credit information might take additional time. 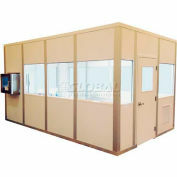 The Cleanroom is constructed of 3 thick wall panels consisting of 24 Ga. smooth sheet steel painted with baked enamel on each side of 1/2 gypsum with a polystyrene core. Units will be 4-wall structures. The framing shall be 6063-T5 aluminum extrusions with a 201R1 anodized clear finish. Wiring raceways shall permit access on one side of the post located on 4' centers. The roof design utilizes a corrugated 20 Ga. steel B deck that is designed at 25 lbs per square ft. for load bearing support with structural steel I beams located on 8' centers. Cleanrooms may require interior columns based on size. The cleanroom ceiling will be 2' x 4' vinyl faced tiles with 1-1/2 gasketed grid system. Units include a 3' x 7 x 1-3/4 thick seamless 18 Ga. steel door and 18 Ga. steel frame with a 2' x 2' x-1/4 thick tempered glass window, ADA approved lever style lockset, mortised hinges, door sweep and door closer. The electrical included consist of a snap together modular wired system (quantities based on size of building): 2'x 4' recessed fluorescent cleanroom light fixture (gasketed) with acrylic lens cover. The fixture requires (4) T8 bulbs (bulbs not included), 110 Volt duplex outlets, wall switch, 2' x 4' 115 v fan filter units (HEPA), handy boxes and a circuit breaker panel (with breakers). Electrical service to the panel and wiring of the breakers are not included. Framed cutouts installed in panels with high wall intake openings of 18 x 24 and low wall return openings of 24 x 24 with return air grills included. Quantity based on size and classification of room. Cleanrooms do not come with a finished floor. Color is white.